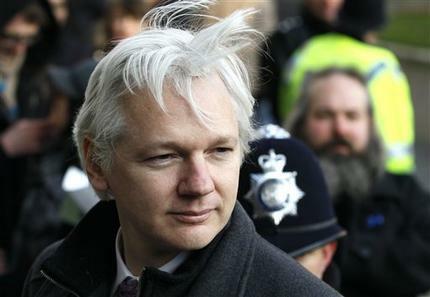 Ecuador - Ecuador’s foreign minister says Wilikeaks chief Julian Assange has taken refuge in the South American nation’s embassy in London and is seeking political asylum. Foreign Minister Ricardo Patino says Ecuador is weighing the request. The move comes less than a week after Britain’s Supreme Court rejected Assange’s bid to reopen his extradition case. His legal struggle to stay in Britain has dragged on for the better part of two years, clouding his website’s work exposing the world’s secrets. Asylum doesn't work for criminals. Furthermore, I doubt Ecuador wants to incur the wrath of the US. One of his first leaks is an attack on "terrorists" in Iraq, from a US Apache helicopter. If you watch the entire clip, you won't wonder why the US will do anything possible to shut him up, and deter anyone else from exposing the bitter truth of wars, the animalistic traits that can overtake -otherwise- regular, humans. Maybe what he did was a good thing, something we should all be grateful for ? Maybe the "only" things that forces the Military (and all government forces) to educate, train & enforce a human-friendly behavior of soldiers on the battle0field are those leaks ? ,"Maybe" he did some damage -other then embarrassing politicians- , maybe not. I don't think we have the tools to know the truth. However. let's think for ourselves before we accept as holy that he is a Criminal. Again; to understand what I'm suggesting, it's important to watch that video of the helicopter attack. What does he think ? What does she think ? What do they think ? Unfortunately, the Brits screwed up by allowing him to seek refuge in the Embassy. Ecuador will likely grant asylum based on his claim of being a "political prisoner" and not recognize the assault charges in Sweden (which is the basis for the pending extradition request). They also won't allow for extradition given his legitimate fear of capital punishment should Sweden transfer him to the U.S.
“ One of his first leaks is an attack on "terrorists" in Iraq, from a US Apache helicopter. What do _I_ think? Do you really want to know? I think you are an ignorant meddling nincompoop who knows nothing of the issue, but are trying desperately to stir up dissent. You sound angry. It's not healthy. Relax, take a drink, gaze at the beautiful sky or whatever works for you. Save your anger for things worth it. Your comment points out how easy it is for us to act out of anger -or any emotion for that matter-, without even giving a glympse to see if our brain, logic, rational reasoning has something to contribute. Oh, by the way, Dont bother with my satisfaction. You seem to be a intelligent person with lots to contribute to society. Dont waste your briliance on my satisfaction. History is going to show that This guy Assuange only got publicity and DID NOT change the world.